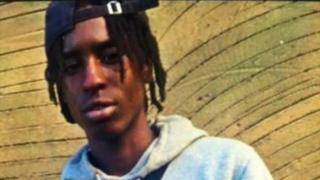 Two people have been charged with the murder of a 17-year-old boy who was stabbed to death in north-east London. Elijah Dornelly was attacked on High Street, Walthamstow, on 7 May shortly after 23:30 BST. Esra Abeka-Soares, 18, of Caxton Road, Southall, and a 17-year-old boy from Walthamstow, who cannot be named, have both been charged with murder. They are both in custody and due to appear at Thames Magistrates' Court on Wednesday.